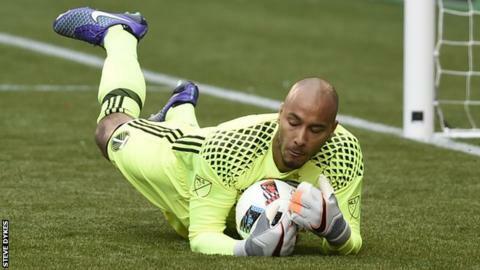 Ghana international goalkeeper Adam Larsen Kwarasey has joined Danish side Brondby from Norway's Rosenborg. The 29-year-old, who withdrew from Ghana's 2017 Africa Cup of Nations squad with a back injury, has signed a four-year deal until December 2020. "We have signed a very experienced player who is keen to win," Brondby sports director Troels Bech told the club's website. Kwarasey has won league titles with his last three clubs. He enjoyed success with Strømsgodset (Norway), MLS side Portland Timbers of Major League Soccer and Rosenborg BK. Meanwhile, another Ghanaian on the move is Liberty Professionals midfielder Latif Blessing. He has sealed a three-year deal with Major League Soccer side Sporting Kansas City. Blessing, 20, was voted the 2016 Ghanaian Premier league's Most Valuable Player and was the top scorer with 17 goals for Liberty. His scoring form in the domestic league prompted Ghana coach Avram Grant to include him in his provisional squad for Gabon. Sporting KC Manager Peter Vermes believes signing Blessing, who has an option of additional year, will give the player a platform "to reach his potential". "We have scouted Latif and been very impressed with what we've seen from him," Vermes said. "The great thing we love about him is that he is young, but with a lot of potential as evidenced by his goal scoring record with his previous club. "With every player you acquire, you always feel they have potential, but we also think he has a great attitude, and we think he has the ability to reach his potential with our club."